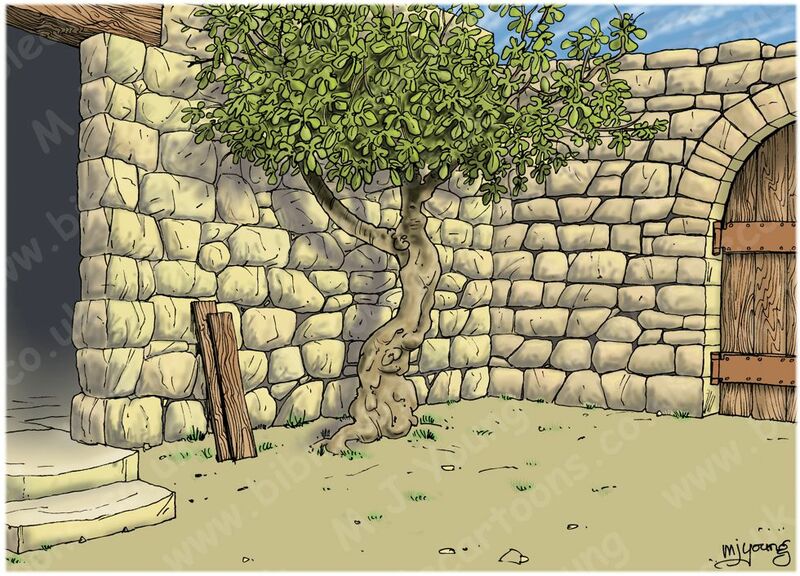 [39 A few days later Mary hurried to the hill country of Judea, to the town 40 where Zechariah lived.] 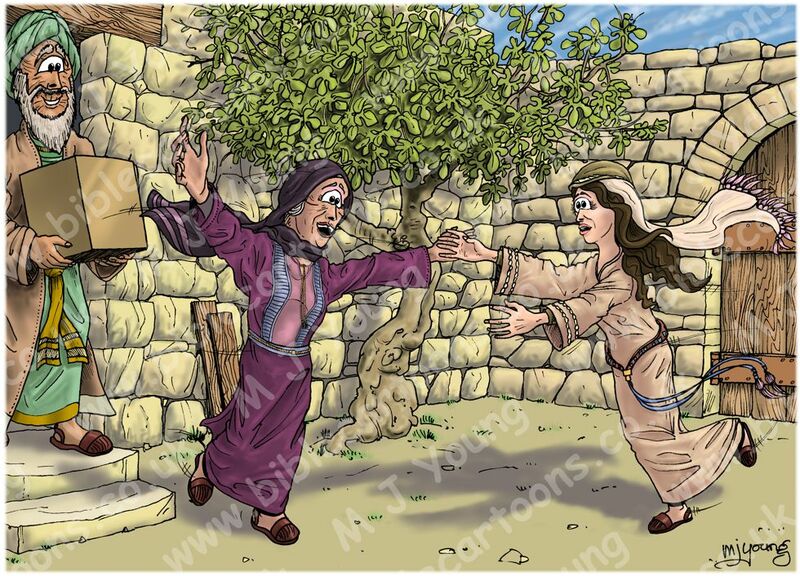 She [Mary] entered the house and greeted Elizabeth. 41 At the sound of Mary’s greeting, Elizabeth’s child leaped within her, and Elizabeth was filled with the Holy Spirit. Mary is likely to have arrived during the daytime, I have set the scene in mid to late morning. The sun (above & to the right) illuminates this scene. 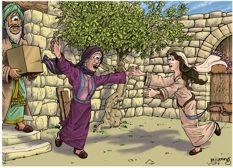 This scene shows an emotion-charged greeting between Mary (the young figure running in from the right) & Elizabeth, the older woman running to greet her, from the left. Zechariah (who still can not speak after his encounter with the Angel Gabriel in the Temple of the Lord in Jerusalem) is walking out of their home with a box in his arms. Notice how glad Zechariah & particularly Elizabeth are to see Mary, & how emotional Mary looks as she flings herself at her relative. As Mary arrived, Elizabeth’s baby leaped in her womb for joy, and at that moment Elizabeth was filled with the Holy Spirit. Zechariah also was later filled with the Holy Spirit (see Luke 1:67). It is interesting to contrast the way the Holy Spirit operated prior to the day of Pentecost (see Acts 02) & after. Before Pentecost the Holy Spirit was given to specific people, for a span of time, in order that they might preform a special duty or task, such as mentioned here with Elizabeth. After Pentecost believers were filled with the Holy Spirit & He lives within them constantly. Note: this scene (Luke 1:40-45) takes place before Pentecost.